254 Marlborough is located on the south side of Marlborough, between Exeter and Fairfield, with 252 Marlborough to the east and 256 Marlborough to the west. 254 Marlborough was built in 1887-1888 by David L. Rand, mason, for building contractor Silas Whiton Merrill, one of three contiguous houses (254-256-258 Marlborough) built for speculative sale. He is shown as the owner on the original building permit applications for all three houses, each dated April 14, 1887, and on the final building inspection reports for all three houses, dated May 9, 1888. Neither the applications nor the inspection reports indicate an architect. 254 Marlborough was built on a 24 foot wide lot, the eastern portion of a 24.5 foot lot that Silas Merrill purchased on June 9, 1886, from the Commonwealth of Massachusetts. The remaining six inches of the lot, with the western portion of the party wall, became part of the house he built at 256 Marlborough. Click here for an index to the deeds for 254 Marlborough. On November 5, 1888, 254 Marlborough was purchased from Silas Merrill by Susan Goodman (Clark) Stellwag, the wife of Gustav Stellwag. Gustav Stellwag was treasurer of the Boston Clock Company. They previously had lived in New York City, where he had been a dealer in silk. They continued to live at 254 Marlborough during the 1897-1898 winter season, but moved thereafter back to New York City. In the early 1900s they maintained a home at 2 Avenue Montaigne in Paris. She continued to own 254 Marlborough and lease it to others. During the 1898-1899 winter season, 254 Marlborough was the home of banker William Pratt Lyman and his wife Helen (Beeckman) Lyman. They previously had lived at the Hotel Berkeley (southeast corner of Berkeley and Boylston) and prior to that, during the 1895-1896 season, at 292 Marlborough. They also maintained a home in Nahant. By the 1899-1900 season, they had moved to 435 Beacon. By the 1899-1900 winter season, 254 Marlborough was the home of banker Henry Sturgis Grew, II, and his wife, Ethel Gertrude (Hooper) Grew. They previously had lived in an apartment at 330 Dartmouth. They also maintained a home in Manchester. On August 21, 1902, 254 Marlborough was purchased from Susan Stellwag by Henry Grew’s father, dry goods commission merchant Edward Sturgis Grew. He and his wife, Annie Crawford (Clark) Grew, lived at 185 Marlborough. Henry and Ethel Grew continued to live at 254 Marlborough. Edward Grew died in January of 1916. In his will, he left his property, including 254 Marlborough, in trust for the benefit of his wife during her lifetime. Annie Grew died in November of 1924, and on June 18, 1927, Henry Grew acquired his siblings’ interests in 254 Marlborough. Henry Grew died in July of 1953. Ethel Grew continued to live at 254 Marlborough until her death in January of 1970. On October 26, 1970, 254 Marlborough was purchased from Henry Grew’s estate by Robert L. Horowitz, Richard N. Nemrow, and Francis C. Pratt, general partners in Residential Associates of the Back Bay LP. On April 25, 1971, they applied for (and subsequently received) permission to convert the property from a single-family dwelling into a three-family dwelling. 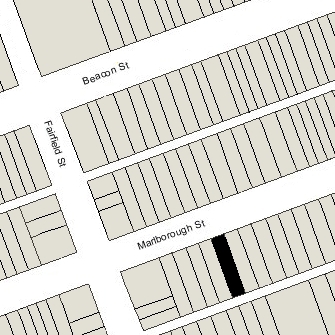 On January 4, 1972, they converted the property into three condominium units, the 254 Marlborough Street Condominium.